Choosing a perfect grow tent is definitely a part of making the best indoor gardening. A 3×3 grow tent is ready to offer you the most professionalism with efficient light coverage, air flowing and other necessary components. Again it enables you to experience healthy growth of your plants. 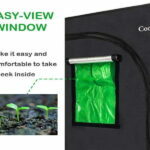 The best thing about these grow tents is the effective use and guideline for the beginner level gardeners. If you are a newbie in this field, having this growing tool will definitely cut off your worries. In this review, we will help you to choose the best one grow tent with maximum facilities and quality. If you are struggling with grow tent height issues, and then this new item of the Gorilla brand will make new waves to your ocean of wishes. This 3×3 grow tent is brilliantly keeping the legacy of the Gorilla brand. This is one of the most powerful and durable growing tool for its stronger zone and thick materials. This one creates perfect space and nicely stands 4’11” that ideally brings about maximum height adjustment. Here it includes adjustable extension poles that are perfect for enhancing the height. It features with 1680d fabric steel frame that is good enough for the long-term use. It can widely carry out at least 300lbs. Again, the powerful industrial zippers zip smoothly. It won’t create any issues at all. The construction of this new gorilla product is amazing. The brilliantly designed ducts and vents are impeccable feature that will exceed your expectation for sure. This performs well with maximum fresh air flow and wonderful ventilation system. The micro mesh filters are intelligently added with the Gorilla Grow tent Shorty 3×3. They are bug resistant and prevent unwanted pesticides. Plenty of ports are there for managing the essential equipment’s like extracts fans, filters, and dehumidifier’s etc. well. And this will leave a good impact on the plant’s quality of growth. The lights are great to use with no leaks at all. The thick poles are super strong. There is a spill tray for easy cleaning maintenance. EZ view windows allow easy monitoring. It has a mesmerizing design. 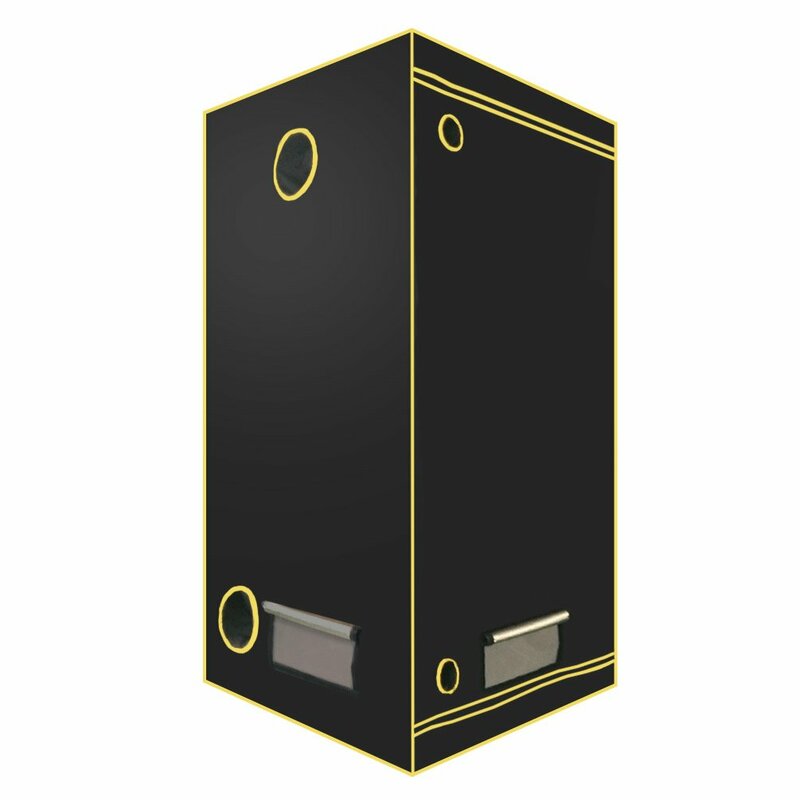 You won’t find a discreet box with the unit. Apollo Horticulture grow tent is renowned for manufacturing the best grow lights for indoor planting. The consistent service with fully featured qualities presents the ultimate yielding for the users. Your indoor gardening will get a new touch of unbeatable service of this brand. The solid metals frames are highly constructed to increase the durability. Henceforth, they make it secure enough for consistent use. If you want to avoid uncertain outside exposure, the double stitched fabric is going to fight with that hurdles. The heavy duty zippers are exceptionally an attractive feature of the Apollo Horticulture. It is coated with heavy duty metals that are pretty much protective for indoor growing. Moreover, it incorporates with 100% light proof materials. The Mylar film is pretty much reflective in properties. It returns approximate grow light bulbs to the cultivated plants. This feature is highly reliable for saving the energy bill. Since the Mylar lining has the light reflection capacity, it is going to maximize the grow light’s intensity as well. Again, this grow tent feature is amazing at heat and temperature management. In this section of this grow tent review, I would like to mention about cleaning maintenance. A removable floor tray is there for you to clean the spills and make the inner environment neat and clean. The reinforced materials are exceptionally good to improve the quality. It enhances the security of the tent maximizing the durability as well. Moreover, it prevents any kind of odor leakage and fights with pest’s harmful activity. Apollo Horticulture grow tent manufacturer incorporates an easy assembly for the customers convenient use. Reading the instruction, one can easily comprehend the step by step instruction. Also, they can utilize it to set up the tent. No matter, if you want to establish your grow tent in apartment, greenhouse or any rented area of your choice, this tent provides estimate value in your decision. The manufacturer provides 90 days warranty. That’s why you can exchange defective equipment’s easily. The materials are both tear proof and light proof. It provides fresh air to the plants. Powerful strong tubes are associated with the frame corner. No light leakage will interrupt the indoor growing. It is overall a great tent but a few of customers get poor zippers and make issues for that. VIVOSUN is a promising and renowned grow tent for professional growers for its outstanding craftsmanship. 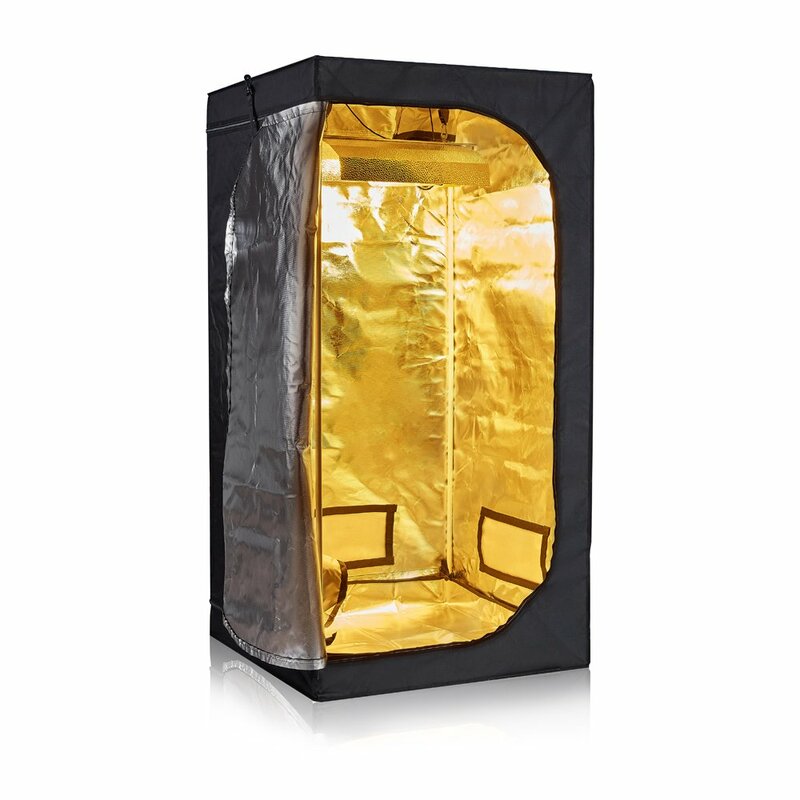 This grow tent is providing light escaping features with the 98% reflective Mylar. The effectiveness of the grow tent is going on nicely with this feature. It features with a high-grade quality 600D canvas. This tear proof and thick materials are absolutely suitable for light blocking. Sturdy metal poles support the canvas and make it comfortable enough for the installation. 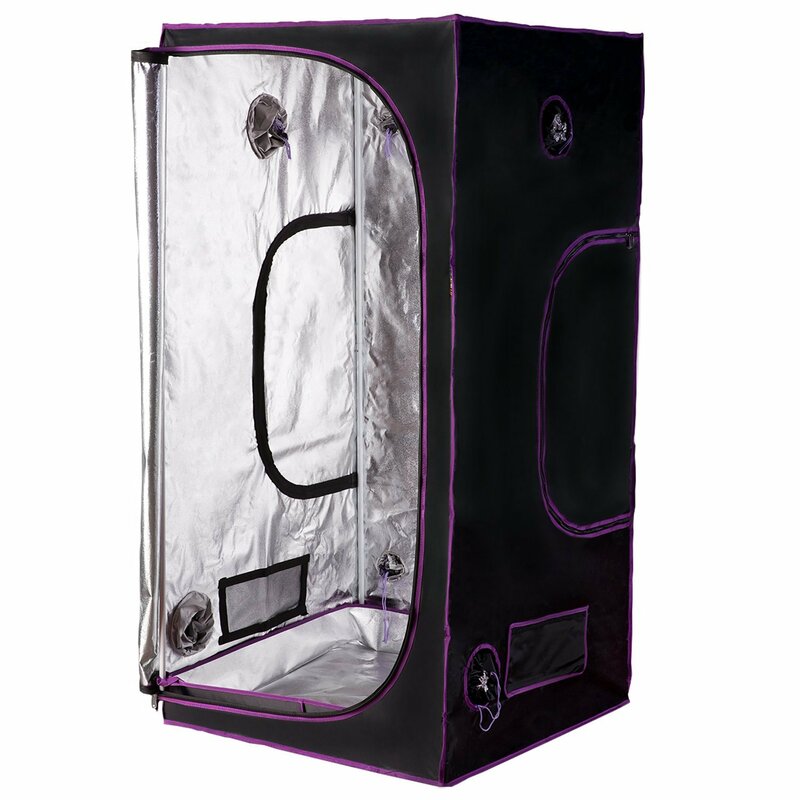 VIVOSUN 36”×36”×72” Mylar Hydroponic Grow Tent allows easy monitoring over the plants, herbs or vegetables. Here, you will get a door for getting in easily. To check the indoor activities, the large viewing window is enough. The carbon filter belts are pretty much good to use. For air ventilation system, this is one of the greatest features of the manufacturers. Moreover, the tool free connectors delivers durable construction to this grow tent. Consequently, the double layer ventilation fan completes the total unit seals tight fully. The zippers are strong enough for functioning nicely without getting stuck suddenly. For ensuring better cleaning, the detachable floor tray is a brilliant addition. To make the growing environment peaceful and conductive, it helps you a lot. It features a tool organizer inside. The grow accessories are being kept here with security. It helps a grower to peacefully organize the tools in order with safety. In addition, an instructional pamphlet is there for the users to get the right directions. It is beneficial for getting set up the grow tent properly. The stitching is perfect for increasing security. The poles seem to be solid in construction and colorful in design. You will get the sucker pretty much strong. It has a great design. It provides fresh air flow with nice ventilation system. This is overall a great tent but poor pin holes are not satisfactory for the users. TopoGrow D-Door grow tent is presenting the whole package with wonderful materials and connectors. A bundle of set frame features with it along with stable rods and connectors as well. The manufacturers thoughtfully designed this tent with the attractive features. This is suitable for both beginners and professional gardeners as well. Moreover, it has 100% reflective materials. This feature aims to deliver equal distribution of the light over the plants. The waterproof diamond Mylar is great at increasing the reflective effect. It covers the TopoGrow unit with a 600D oxford cloth. This heavy duty and lightproof material efficiently increase the durability of the tent. In addition, sturdy connectors made things easy to maintain for a beginner. The metal rod has been designed with white paint. This 16MM rod is stable and prolongs the maximum usage. Again, there are multiple vents associated with it. It helps in managing the airflow and systematic ventilation. Therefore, the vents are rectangular in size. You can expect sound ventilation from this excellent tent. Since the heavy duty zippers are being coated with double stitching. That’s why no light can go through it. Eventually, it is highly protective and never stuck at all. The assembly instruction is user-friendly. For a beginner, it is very tough to understand the set up. Reading his easy instructive pamphlet, a newbie grower can apprehend the directions without any confusion. I assure that this grow tent is worth for the money too. There are numerous holes that are amazing for better ventilation. Again, you won’t have to worry about shipping. The company makes the delivery too fast. Once, you start using it, I hope, you will love to buy it again. Putting it together is very simple to do. High grade materials are used here to design it. Ventilation and lights are wonderful and works great. No hard effort is required to set it up. Zippers may seem rough at first time but slowly it becomes smooth for using. If you are looking for a grow tent with awesome quality and affordable price, GROWNEER is one of them. It has a wonderful dimension and size that will make you overwhelmed with pleasant experience. Featuring with a great construction is highly praiseworthy for your buying purpose. It is made of light proof materials. It reflects approximately 96% light.Including a Mylar lining, it exceptionally performs well in setting up light. The power configuration runs well with no interruption as well. The observation window is another praiseworthy feature that is bound to get claps. You can have a convenient checking on the plants without opening the tent. The thick canvas is suitable for light blocking as it has double stitched elements. The 600D canvas is highly beneficial and gets reinforced by the sturdy metal poles. This is useful for the ultimate protection and security. The heavy duty metal zippers are including a great safeguard for the plants while using. The growing runs smoothly with these excellent features. Again the zippers allow easy functioning and accessibility for you. If you are tired of getting poor zippers that gets stuck as soon as it starts running, then this product will make new waves to this industry. The zippers are too good that the manufactures claims for. The positive feedbacks are also a solid proof about the zipper. Another great thing is the 1 month of money back guarantee by the company. It is 100% hazardless. You can replace the faulty parts within this limited time. It has 6” duct holes that is eligible for better ventilation. It seems easy to assemble together when needed. The peek window is good to see and works brilliantly to monitor the plants. The price is reasonably good to buy. The construction is solid for the plants favorable growth. Small pin holes might be an issue for the users. Using some glue can work best for it. VIPARSPECTRA is a grow tent product that suits the best for the Horticulture Industry. It offers secure growing for every plant you want to grow in it. There are maximum opportunities for every gardener having the fullest control over the crops by using it. The plants will be strong enough beyond your expectation. VIPARSPECTRA is containing high class light proof reflective material. It provides 100% reflective effect that leaves positive impact to the plants healthy growth. This tent is well-constructed with mesmerizing design. It will grab your attention for sure. First of all, look at the heavy duty zippers that are double stitched. This fabric is perfect for good security of the plants. Next, it comes with round vents. Moreover, different size of extract fans, carbon filters along with rectangle windows are great addition of this tent. They help in mitigating insects and keep it safe from dusts and confirmconvenient ventilation. However, clean environment is vital fact when you want to grow indoor plants perfectly. VIPARSPECTRA grow tent also never compromises with it. It includes a waterproof floor plan. This feature ultimately decreases half of worries. The plants will get flourished when you after getting a neat and clean environment as well. The whole structure of the unit is made of sturdy metal tools. It is attached with a solid steel corner connection. These tool free connectors will take care of the frame and lock system perfectly. Moreover, the metal poles are well-constructed enough. It can manage to carry out at least 110lbs. It is suitable for cultivating tomatoes, pepper, lettuce or any kind of seasonal fruits. 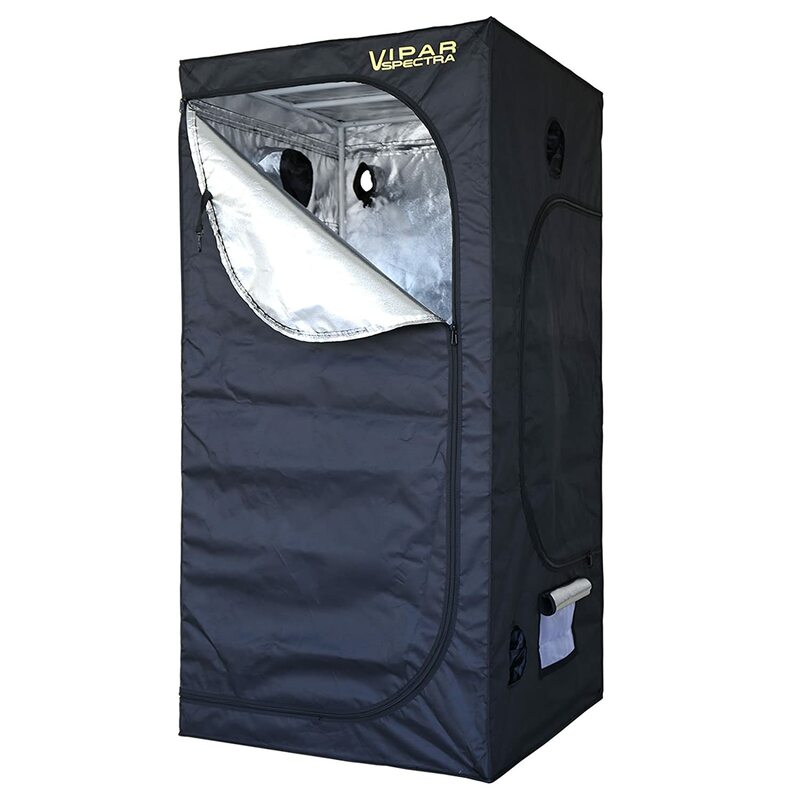 This grow tent is perfect for essential equipment’s like fans, filters,and light. The materials are solid and reliable. A grower won’t have to use any tool to put it together. Zippers slide easily without any hassle. This is non-toxic and decent grow tent for the price value. Lights are seen from the door but this is not a major issue at all. 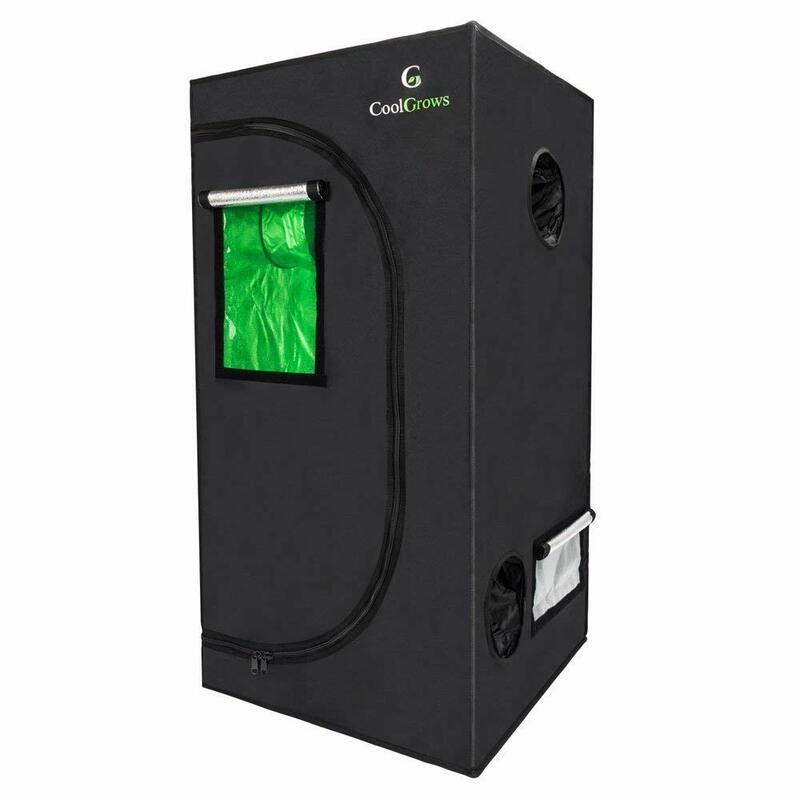 CoolGrows 36”×36”×72” is another great option of 3×3 size indoor grow tent. The most attractive and convenient feature of this model is the outstanding dimensions of the window. To monitor the ultimate growth of the plants and herbs, this observation window is wonderful. Hence, the construction is made of high grade 600D materials. The value box is another great feature of this hydroponic grow tent. It produces suitable environment that is conductive for the healthy growth of the plants. The highly reflective materials are the one of the greatest features of the CoolGrows grow tent. To maximize the intensity of the lighting fixtures, this is highly beneficial for you. Moreover, it manages the temperature that makes the plants blossom in a great way. Since the reflective materials are the best for dealing with power configuration, it increases the efficiency of the grow tent. In addition, hard canvas is another wonderful feature of this grow tent. Here, you will find a 600D material. This tear proof feature has been designed with double stitched fabrics. It acts the best for preventing the immediate light blockage. Hence, the powerful metal connectors are a great addition of this grow tent. It is closely attached with a comfortable click connector mechanism. That’s why; you will get it durable enough for use. Again, you should not miss another excellent addition and that is monitoring window. You can solely observe the growth and other accessories management. The zippers enhance the safety of the tent. Moreover, Water resistant tray is there for you to complete cleaning task easily. The odor managing feature is a great addition to safeguard the environment from unwanted pollution. There is useful hanging equipment along with magnificent filter straps. Great customer service is managed with trustworthy 1 year of warranty. It defines a good set up system. The thick materials are impressive. It is very easy to assemble the equipment’s without any hard effort. The attachedback-flap seems to be a bit of short in size with the zipper. The grow tent that will grab your attractive attention with its amazing features and efficient professionalism is the iPower grow tents. This unit presents an excellent growing application with required dimensional package. This package covers outstanding light coverage with 99% light proof materials. The metal poles are there to prolong the maximum stability. The zippers are well-fitted and suits with the tent effectively. No light leakage you will experience due to have the double stitched protection feature. The Mylar floor tray incorporates with the iPower grow tent to make your cleaning task easier than ever. The water resistant property of it is useful for a grower. Are you desperately finding a grow tent with which you can control climate? Then this one can fulfill your desire. Cultivate your plants safely and securely whenever you want. Another attractive thing featuring with it is having 95% interior reflective material. This Mylar efficiently covers the grow light bulbs nicely. The plants get required energy and air with its convenient and systematic features. The sturdy frame is useful and specially designed to carry at least 110lbs. These are made of special heavy duty steel poles. Nevertheless, easy observation window makes your work easier to view the current growth of the herbs and plants. For an instance, easy installation and safe using is must to gain from this grow tent. 1 year of warranty allows exchanging the faulty parts of it. If you like more small size then check out our best 2×2 grow tent reviews. 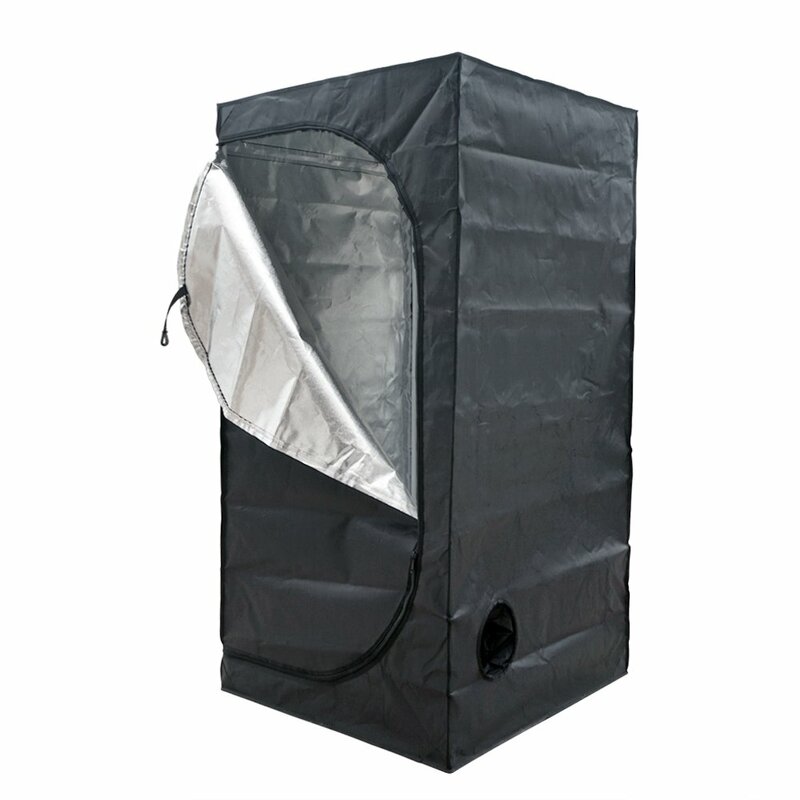 iPower grow tent offers highly graded grow lights fan and filter to use. 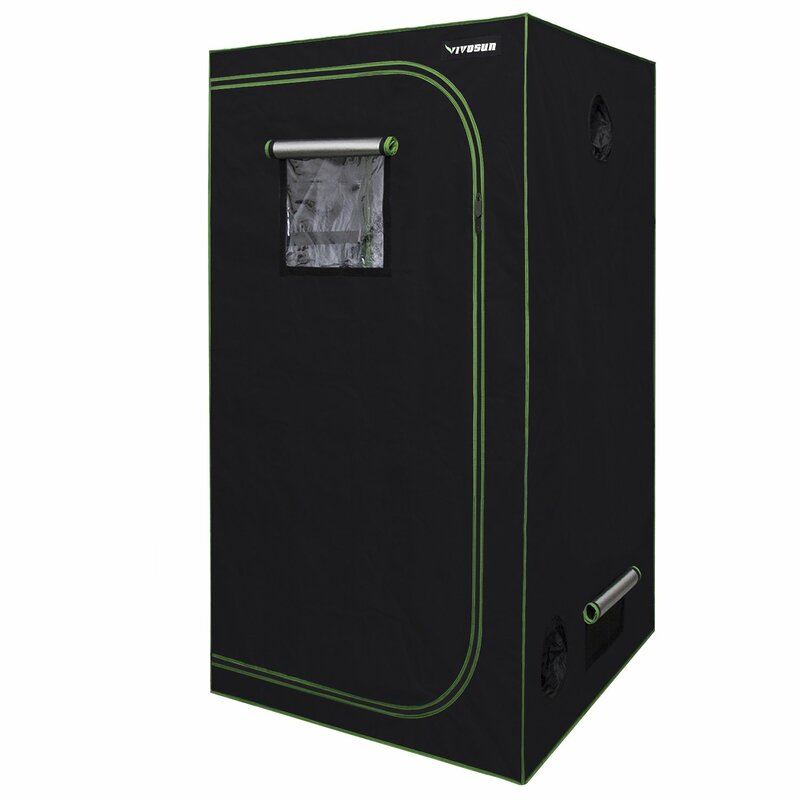 This grow tent prevents unwanted odors producing. Organization tool bag is useful for safety of the materials. It is smooth and easy to clean. Instructive assembly will guide you to make the best use of the tent. The canvas is comparatively small for use. The poles seem tough to handle for its bigger size. If you want to grow herbs, vegetables or herbs whenever and wherever you want, this ECO-WORTHY tent fits your demand with top-most highlighting features. There are thick meshes and vents to increase the ultimate air circulation. Any harmful insects are not allowed to enter in to it. Top quality powerful metal connectors make it strong enough to last for long time with the white pain coated materials. Are you worried about 3×3 growing tent set up? Then you should not worry about it more. It has the systematical investment for hanging lights or fans. In fact, it is well-fitted for different grow lights capacity. 210D oxford cloth is another convenient features that id beyond your expectation. For acquiring the best reflective effect, this feature is mind-blowing in a word. 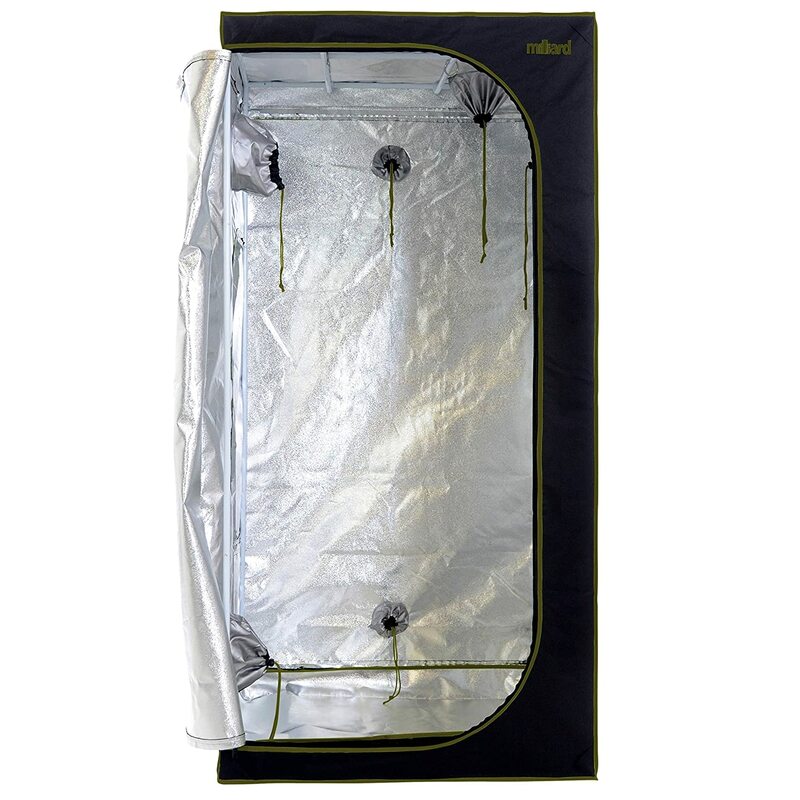 Waterproof and light reflective materials allow easy usage of the growing tent. Again, for easier cleaning, floor tray and other useful, accessories are including with its glorious feature. The hydroponic grow room has attractive properties to handle the relocation. Again two top poles are suitable for the convenient use. The best thing about the ECO-WORTHY grow tent is itswell-constructed quality. It will appear relatively perfect for the price too. Price is, of course, a matter of worry. 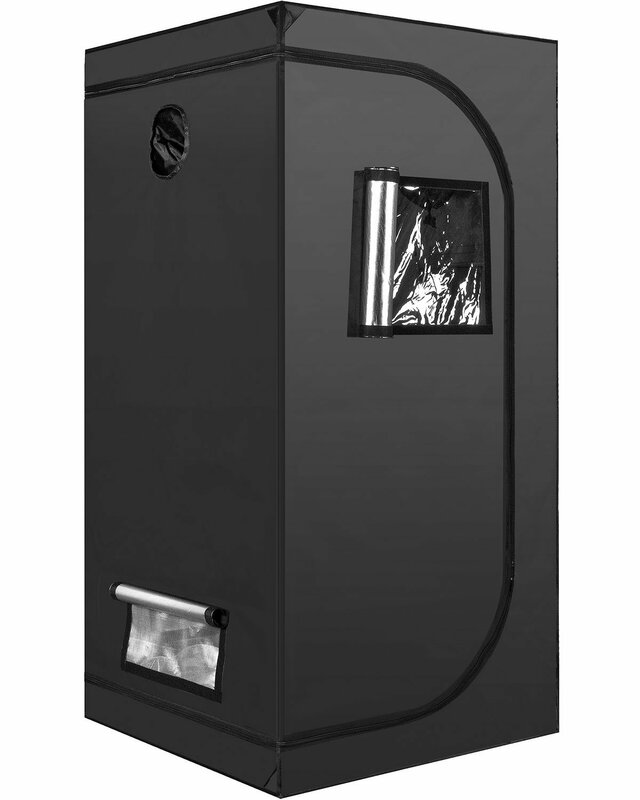 This grow tent is pocket-friendly and allow to buy with reasonable money cost. For the beginners, it will be a lovely investment for buying this tent as it is come up with the right size and height. So, I think it’s time to reap the highest benefits from this eco-friendly grow tent. Also you have option to choose different size. Do you want 2×4 size grow tent ? this size also very popular. It’s very easy to put together the tent whenever you want. The sturdy frame makes a solid construction. It has reflective filter straps. It is easy to install without any hassle facing experience. It allows easy storage for the indoor gardeners. Loose threads can make things worse to deal with zippers. Craving to eat any particular fruits or vegetables? Is it unavailable in the mean time? Then all of your worries should come to an end now. For enjoying foreign fruits, hubs or vegetables in any season, MILLIARD is one of the most reliable grow tent for you.Favorable climate and suitable lighting is badly needed for the healthy growth of the plants. MILLIARD is highly reflective and constructed with inner layer. It maximizes the chances of getting enough lights and heat control. This is highly beneficial for the regular growth of the plants. A solid tubular metal frame features with this size grow tent. This feature is supported with heavy duty bars. The lights and other essential components can be easily hung on it. Also, this increases the longevity of the tent. The excellent lining materials provide different kinds of exhaust ports. This aims at offering reliable vapor and moisture control or every grower. The metal push lock is another spectacular part of this grow tent. With this wonderful system, you won’t need any extra tool to put it together. Also, it cuts of your unnecessary harassment. 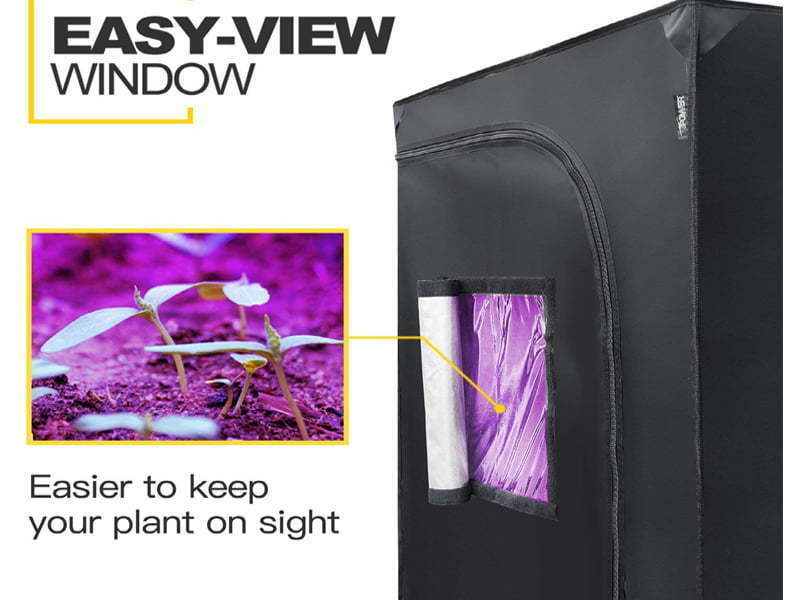 There is a 12” easy monitoring window comes with this grow tent. You no longer have to open the tent to check the interior activities. Convenient monitoring over plants is suitable with this feature. There are two ducting ports of 4” and five ducting ports of 8” are being included with it to enable you for having control mover climate. Also, it prevents light leakage. 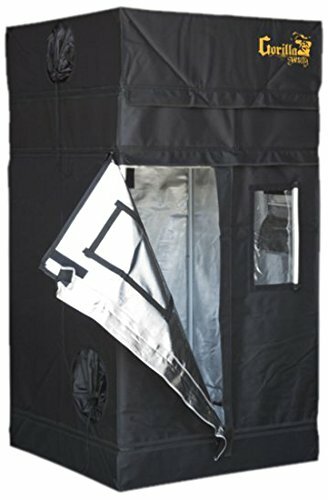 In addition, D-style door with wide zippered system are another attractive feature of the grow tent. One can easily set up the indoor growing components smoothly with this feature. Henceforth, the manufacturer incorporates a waterproof floor pan. It delivers a favorable environment that is conductive for the plant’s growth. The equipment’s are thick and durable. It has better vent holes that ensure good airflows. The price is affordable for buying. The zippers are well-made and zips nicely. It fits nicely with easy operating procedures. It works great but a few of users complains about light leakage in some models. There are plenty of benefits when you start using a 3×3 tent. Having the fullest control over the environmental factors is one of the best benefits of it. Following are the comprehensive list of the necessity of it. It provides ideally safe environment along with the best equipment’s such as lamps, light coverage and reflection ability. If you are a beginner, it will be pretty good investment of your hard-earned money. If you fix to grow cannabis along with the full authority on the entire environment, ithighly suits you. When it comes to have the best yield from a grow tent, then 3×3 grow tent yield is suitable and safe for the gardeners. Moreover, indoor farming of cannabis is highly eligible to reap the highest benefits from it. There are an easy assembly guide associated with almost every grow tent. This makes you understand how to do the 3×3 grow tent set up.This is very simple to follow. First of all, you should determine the place where you want to establish the grow tent. 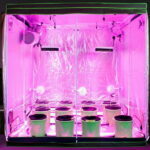 It identifies the fact of how many plants in a 3×3 tent supposed to grow. On the next step, you should make the lighting set up. Then you must select a lighting system to hang it up on the required place. LED lights are the best for it. Next, you must fix the grow lights and heating elements. Using a rope, you can successfully do so. A rope you can use to adjust the right position of them. Pull them on the right places when necessary with the ropes. Later, you must concentrate on the exhaust fans. It influences the ventilation largely. You can hang it nicely with a nylon rope to ensure better air circulation system. When there are so many options to grow indoor plants, why should we use the indoor growing tents? This is a million dollar question. Let’s look at the answers. Grow tent results in providing healthy growth of the plants. The installment of the light is too easy to do. These tents are genuinely made for growing plants in enclosed space. People especially the city dwellers get the best advantages of it. The handy tents are suitable for saving spaces. The bugs and harmful insects are considered as the principle enemy of any farming. The tents are double stitched and that’s why it doesn’t allow any pest’s entrance. The mentioned tents in this review provide 3×3 grow tent yield that is wide enough for good farming. The tents are well-constructed to escape any odors coming inside of it. The air filtration system allows good ventilation by filtering the air. This enables from getting rid of any bad smells. Moreover, from the 3×3 grow tent set up, you can assume the maintenance and follow it by doing so. Your firming experience can be better when you have 36”x36”grow tents. I finally hope and believe that above mentioned tents are worth and very useful for long lasting use. Now the decision is yours to make the right judgment and take a firm decision. We know you are wise enough and have that ability to make out what is good and what is bad. Happy firming.